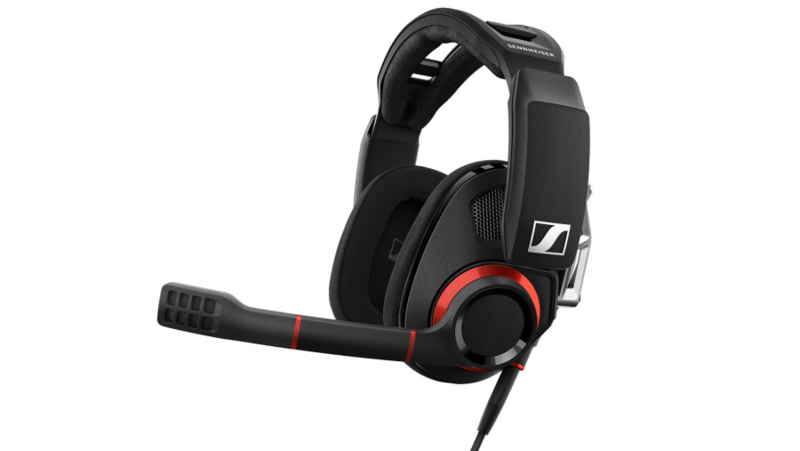 The GSP 500 is the spiritual successor to the ever-popular Sennheiser GAME One headset. Sennheiser is well-know for definition in the high-end, but thanks to the open-back design and a few tweaks to the profile, the GSP 500 pulls off a natural, airy timbre, with just a little more bass than you might expect from the old school audio company. Sennheiser is incredibly well-known in the audiophile world, with its HD 800 headset standing out as one of the best on the market. But that will cost you a pretty penny, and there’s no mic, either. Instead, to fill the gaming market’s needs, Sennheiser has repackaged its renown and expertise once again with the GSP range – taking on quite a few characteristics of the GAME headsets that we’ve been pretty fond of for a while. Gone is the subtle charm of the understated GAME One headset, however. The GSP 500 is anything but understated, actually ending up as one of the largest and most noticeably garish gaming headsets around. 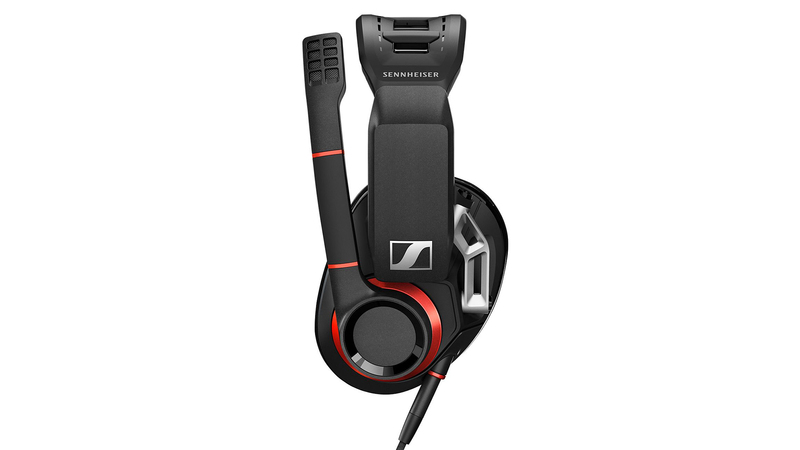 But, at least in exchange for the size and styling, Sennheiser has included plenty of ergonomic features to keep it comfy over long gaming sessions. The GSP 500 is a touch lighter than its GSP 600 compadre – a closed-back headset of almost identical design – but the headset is far from featherweight. To deal with all that weight, brought on by a chunky black plastic shell and integrated mic arm, the GSP 500 features four separate adjustable sliders. The two at the top allow for left and right headband adjustment, while each ear cup also features a slider for vertical adjustments. And all that amounts to a headset which, once catered to your own dome, rests pretty comfortably. Unlike the GSP 600, which favours noise isolation-enhancing leatherette, the GSP 500 comes with breathable fabric. It’s not a terribly ugly headset – it’s Sennheiser after all – but it still stands out on the wearer a little more than I prefer. Especially if you were to wear it out in public. The bulky integrated mic pretty much nixes any chance of using this set for anything other than gaming. Sennheiser has kept to the blanket style the company has upheld across the entire GSP range with the GSP 500. It’s a solid design, too. The mic swivels up to mute, flexes minutely to allow for slight manoeuvrability, and the quality of the noise-cancelling mic is one of the best around. 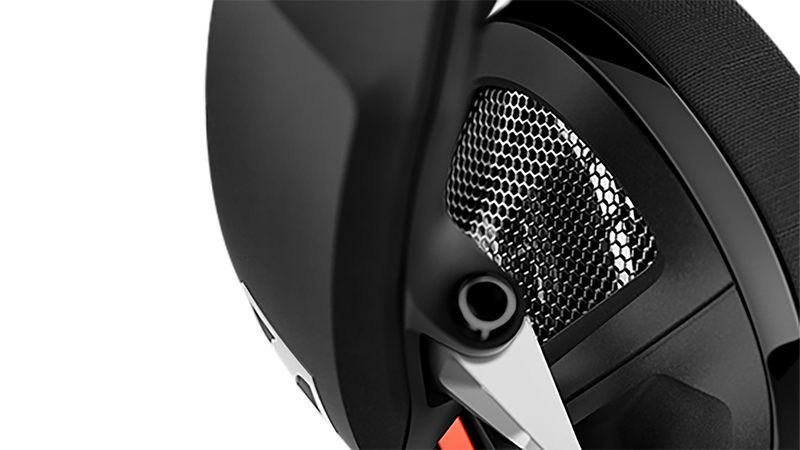 Aside from mic mute, there’s also a volume wheel on the opposing ear cup. But that’s all secondary to the audio quality, which, unsurprisingly, is fantastic. Even Sennheiser has admitted that gamers love just a touch more bass than its usual clientele. The lows have received a little touch up, but the sound profile remains what you might expect from the company. That means the upper frequency is crisp and detailed, and that slightly tapers off towards the lower frequencies, which are far less imposing compared to some other gaming headsets on the market. The open-back design is what makes the GSP 500 stand out, however. Few gaming brands offer open-back designs, but it’s certainly appreciated when a company makes a point to offer headphones with this design in tow. This makes for a fundamental design change compared to closed-back sets and has a huge impact on how the GSP 500 sounds. While closed-back designs are popular for their noise isolation properties, open-back headphones instead trade that for natural sound dissipation through a gap in the rear of the ear cup. On the GSP 500 that’s a rather small opening just above where the hinge for the ear cup sits. The result? The profile of the GSP 500 is far more airy and open. It’s less harsh than most of its closed-back cousins. Whereas the closed-back GSP 600 can occasionally sound pointed in the highs, the GSP 500 doesn’t suffer the same issue. The soundscape is far wider, and that natural touch plays right into the hands of a game’s sound design. Environmental sound plays such a key part in building atmosphere, and the softer tone of the GSP 500 really accentuates well-rounded sound staging. 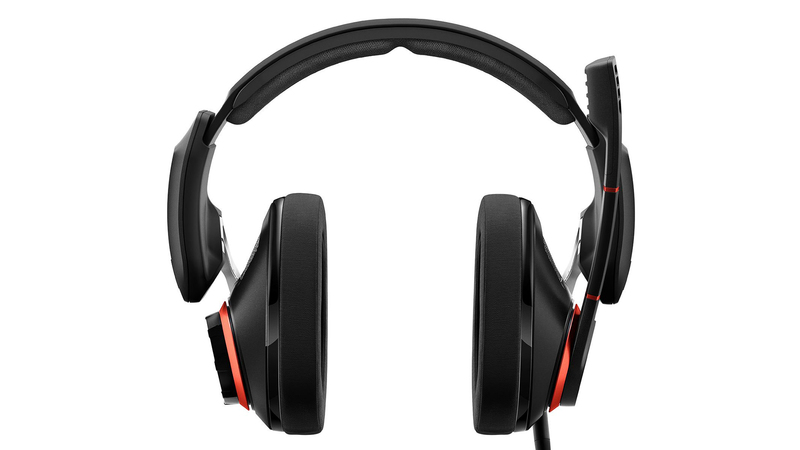 The open-back GSP 500 will set you back $230 (£199), that’s way up there in terms of gaming headsets. While I think the headset sounds exceptional, the jump from one of the cheaper Sennheiser headsets, such as the GSP 300, is considerable. Once you start looking beyond Sennheiser’s lineup some might find the value of another headset, such as the $99 HyperX Cloud Alpha, simply outweighs the benefits of the open-back GSP 500. Sennheiser is definitely on the right track with the GSP 500. The build quality is great, the features decent, and the sound quality almost unmatched in the gaming space. Its price may be too big a hurdle for some, but, in return, you receive a fantastic gaming headset from one of the most reputable audio companies going. If you enjoy Sennheiser’s signature sound, there’s little alternative that can match the GSP 500 without shedding some of the gaming functionality. Sennheiser hasn't forgotten its roots in high-end audio, and that's evidently clear with the GSP 500. Its open-back design creates a spacious sound profile that makes for easy listening and clear definition whether gaming or listening to music. While it's not the cheapest gaming headset out there, the Sennheiser pedigree - evident in the GSP 500's overall quality - just might convince you.